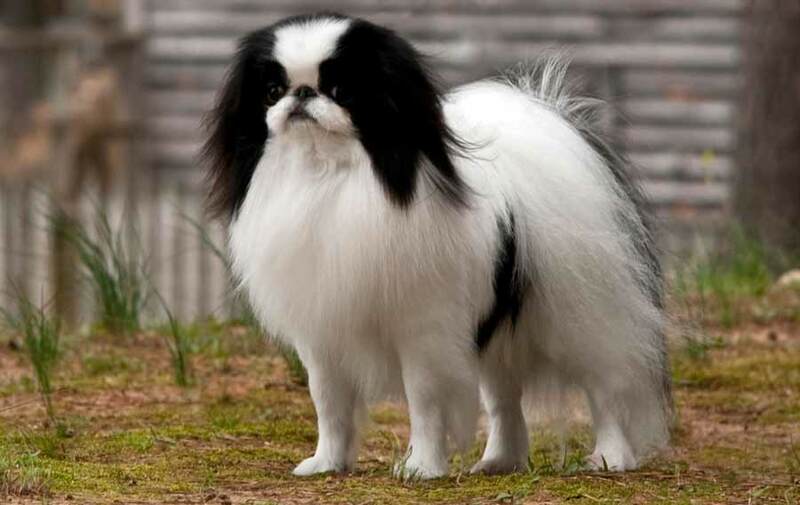 Japanese Chin, also known as the Japanese Spaniel, is an ancient toy breed with a much debated history. Some experts feel the breed originated in China, while others say Korea was the birthplace. In any event, at some point the breed was introduced to Japan, where it became a favorite of the nobility. The Japanese Chin is a small dog breed, standing 8 to 11 inches tall and weighing only 4 to 11 pounds. The head is large and rounded; the eyes are large, round, and dark; and the ears are hanging. The muzzle is short. The tail is set high and is carried up over the back. The coat is single (with no undercoat) and is straight and silky. Japanese Chin has feathering on her tail, the back of the legs, the ears, and around the neck down onto the front of the chest. The acceptable Japanese Chin colors include black and white, red and white, and tricolored (black and white with rust markings). The Japanese Chin’s lovely silky coat needs brushing and combing at least every other day to prevent tangles and mats from forming. The Japanese Chin loves to play and will demand a couple of play sessions every day. Those, along with a nice walk, will satisfy this breed’s exercise needs. This dog should attend a puppy socialization class where she can meet a variety of people, as the Japanese Chin breed is a bit wary of strangers. She is not aggressive or protective, just aloof with people she doesn’t know. Some owners say she’s even catlike. The Japanese Chin is also very bright and enjoys learning new things. Japanese Chin will thrive in gentle, fun, yet structured training and will do well with trick training. Many Japanese Chins serve as wonderful therapy dogs. The Japanese Chin is great for someone who wants a small, relatively calm companion. Japanese Chin is good with children who are gentle and treat her with respect, but is too small for rough play. Japanese Chin is usually very good with other small pets. The Japanese Chin breed does have some health concerns, including cataracts, knee and back problems, and heart disorders. Share your Japanese Chin story. Note: Upload only Japanese Chin picture or your picture with Japanese Chin below - spammer's ip may be blocked. Perky, proud, and playful, the elegant Japanese Chin is less hyperactive and less yappy than many other toy breeds. Though he does love to play in the yard, he doesn’t need much more exercise than that. The yard must be fenced, for he has a spaniel heritage with just enough hunting instincts to chase birds or butterflies into the street. A lover of comfort, the Japanese Chin enjoys cuddling on laps and snuggling into soft pillows, his soulful eyes inviting pampering, which he accepts graciously. However, you’re just as apt to find him perched high on the back of the sofa, for he is an agile climber, light and graceful on his feet, much like a cat. This gentle yet merry breed insists on attention and interaction and is a terrific pet for senior citizens. At the other end of the spectrum, he is easily overwhelmed by small children and cannot take rough handling or mischief. Most Japanese Chin are polite with strangers, though a good many individuals are standoffish or timid, so socialization is important. This breed is peaceful with other pets. Though he has an aristocratic demeanor and definite likes and dislikes, the Japanese Chin is also bright, sensitive, and responsive. The little obedience training he needs will go well if you rely on consistency, praise, and food rewards.